I use watercolor pencils to add color to my carving work. I’m pretty sure I’m not the only one to do this, but I’ve never seen any step by step description of the process. Here is a pictorial run though of how I do it, the materials I use and my thoughts on the process. 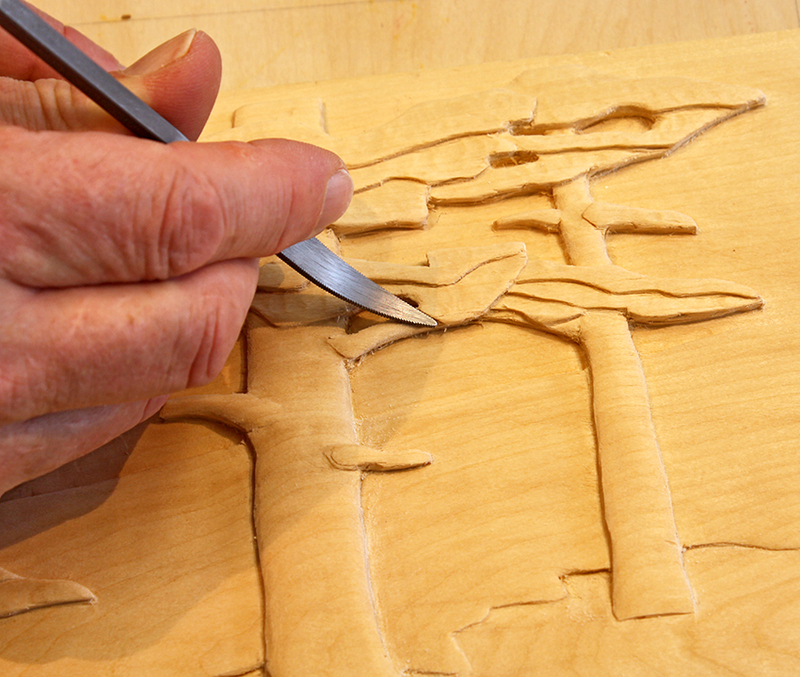 I use solid basswood for the carving. Basswood is relatively soft and inexpensive. It’s “carver friendly” but as with any wood each piece behaves a little differently. This piece is plain sawn so the grain shows cathedral-shaped arches. That looks cool but introduces some problem areas while carving. When I’m “done” with the carving I spray a light coat of shellac on the surface. I use Zinssers Bulls Eye in a spray can from my local big box store. I make a pass from each direction to coat the surface evenly and get in all the nooks and crannies. After it dries I go over the surface with a maroon Scotch-Brite pad. 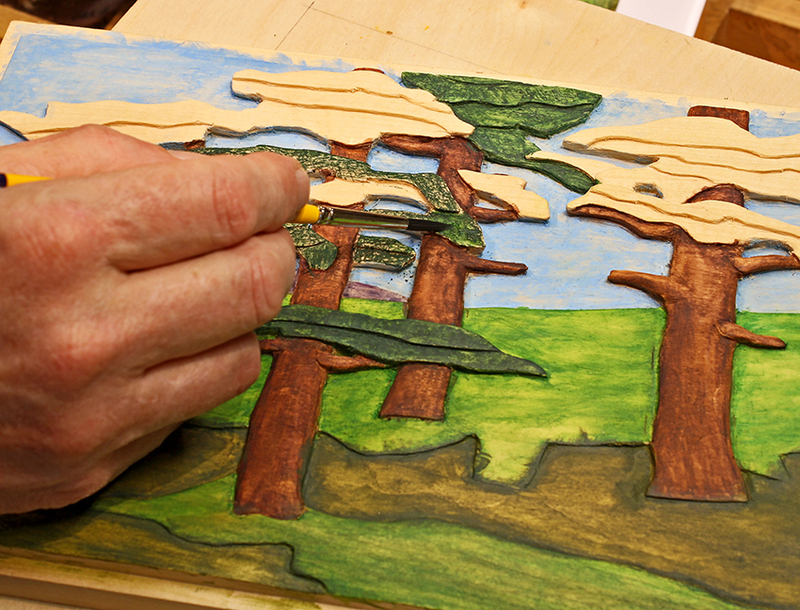 The shellac acts as a barrier between the wood and the watercolors. Getting the surface texture just right takes some practice. Too much shellac and the surface is too smooth for the color to adhere to. If the surface is shiny there is too much. Too little and the color bleeds into the wood and looks fuzzy. The shellac raises the grain some, so the abrasive pad removes the roughness as it provides some tooth for the color to adhere to. I also go over the carving with a riffler file to remove any rough or chunky spots in the corners. 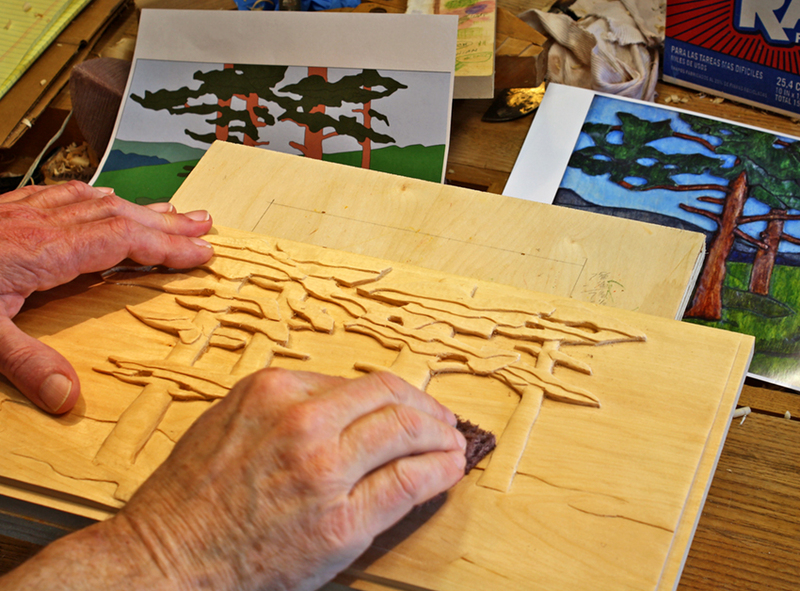 The carving is undercut so that the wet color flows into the background, hiding the transition from one color to the next. When the surface has the proper tooth I start coloring with watercolor pencils. I use Derwent Inktense pencils. There are other brands, but the Inktense are resistant to fading over time and they are also “fixed” when dry. Normal watercolors are still soluble in water after drying, but these allow you to build up layers, if you’re patient enough to let them dry thoroughly. I cover the wood with a hatch pattern and as I scribble with two or more colors I can judge what the blended color will look like. The next step is to take a brush, dip it in water and start washing the surface. The amount of water in the brush makes a difference in what happens next. The idea is to liquefy the colors and spread them evenly over the surface. It takes practice to get that right, and how well the color spreads is also related to the condition of the surface. If there isn’t enough tooth to the surface the colors can bead up or smear around without adhering. With practice you’ll get the hang of it. The colors can be loaded and mixed onto the brush if you need to add color to a specific area. Just take the wet brush to the tip of the pencil to load the brush with color. In the picture above I started with dark blue and then went to the white pencil. I’m judging the mix by comparing the color on the end of the pencil to the color already on the carving. This method allows for a lot of variability. 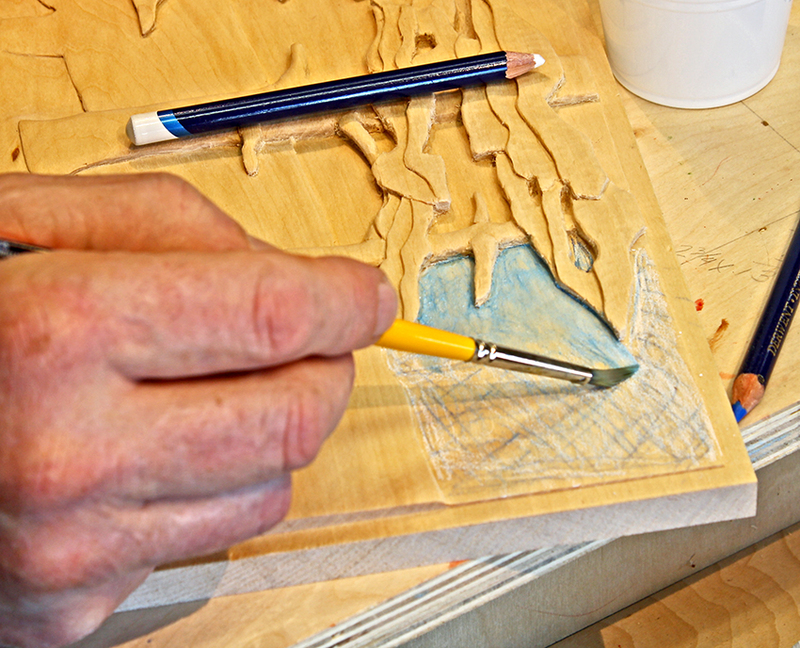 More pencil on the surface prior to brushing gives darker colors and less pencil makes for a more translucent surface. 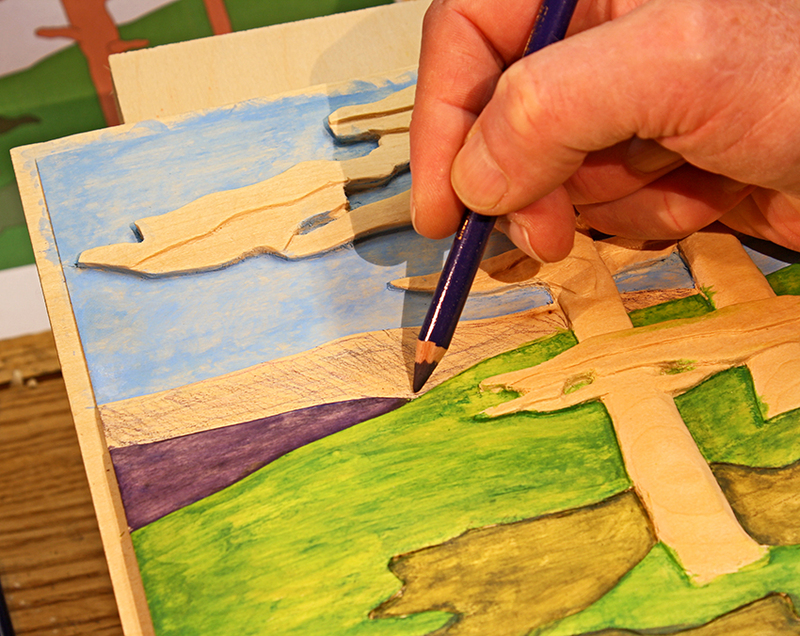 While the surface is wet you can add more pencil to intensify the colors if the surface is too light. If the color is too dark you can use a dry brush to pick up some of the color. 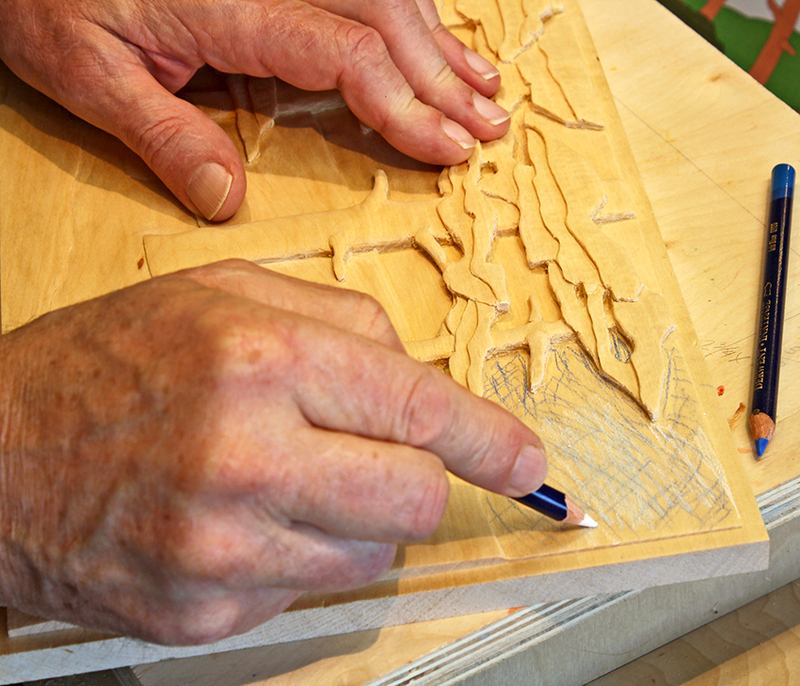 It’s a good idea to make a sample board, with the shellac coating and texture as close to the carved surface as possible to test color combinations before applying colors to the finished carving. 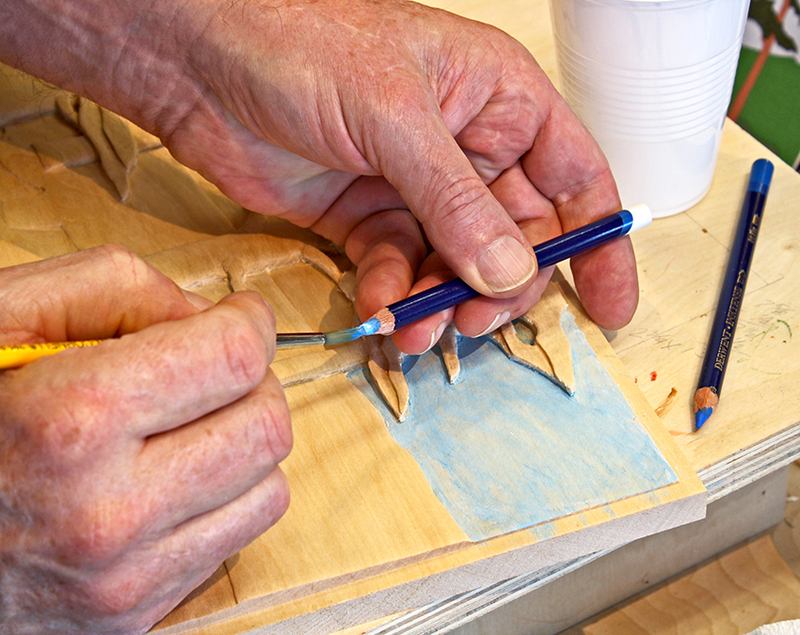 Testing colors on paper won’t look the same way as they appear on wood; penciled colors don’t look the same as when they are brushed, a wet brush surface doesn’t look the same as a dry one and the final top coating also has an effect. This is art, not science so you have to experiment. I do an initial round of applying color to the entire carving to get a sense of how the colors look next to each other, let it dry and add layers to deepen colors if needed. 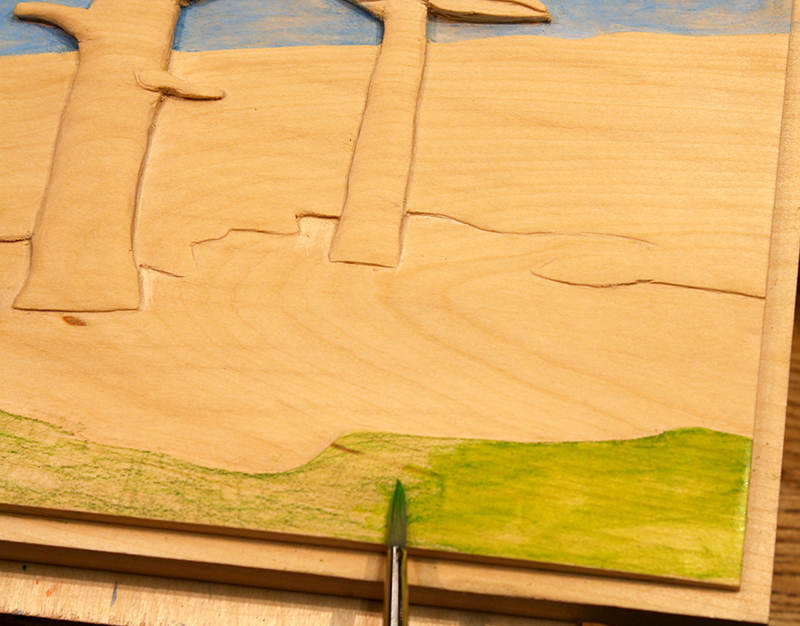 I try to apply color to the lowest areas of the carving first and lighter colors before darker ones. It can be tricky to reach into a small area without getting paint on an adjacent area that is higher. 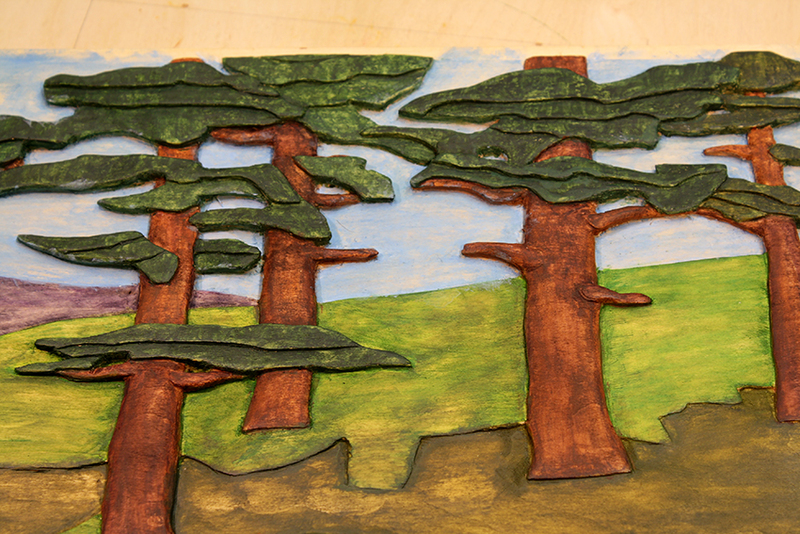 That’s OK because the dark color on the leaves or tree trunks will cover the small spots of the grass and sky colors. Developing the right touch allows you to do interesting things as you combine the pattern of the pencil work with the amount of water on the brush. I try to liquefy a mottled pattern without spreading it around too much. 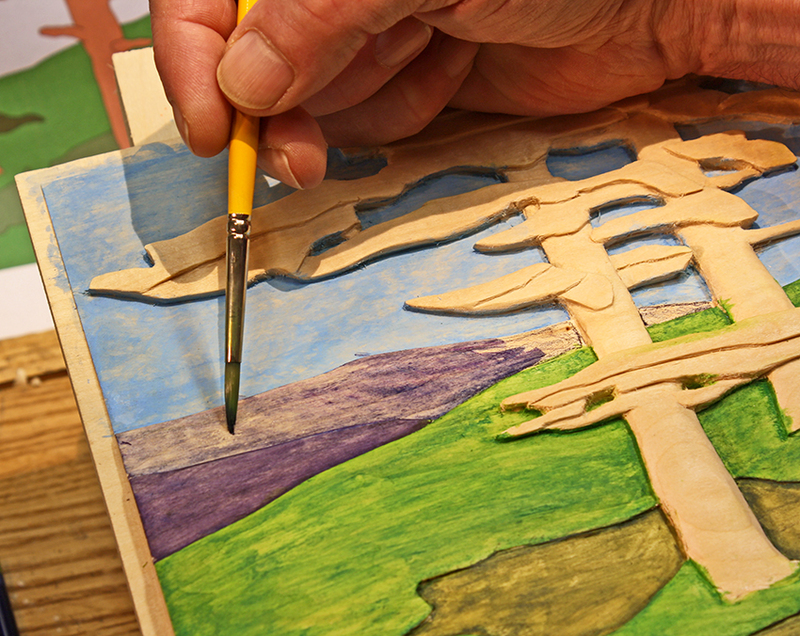 When all the color is applied, the work needs to dry completely. Then it can be top coated. I use shellac for the first coat. The clear shellac from the spray can makes everything a little darker. Shellac also comes in amber and garnet. These will warm up the color and give more of an aged look. These can be mixed together for varying effects. If you lack spray equipment, the shellac can be thinned with denatured alcohol and applied with a brush or a rag. Shellac is shiny when dry, but the sheen can be controlled after the surface is dry by rubbing it with an abrasive pad. That risks rubbing through the color. The less risky alternative is to use a dull or satin lacquer as a top coat over the shellac. Lacquer from the hardware store doesn’t come in a variety of sheens and has a very low solids content. Behlen Jet Spray is much better stuff and you can buy it online at Tools for Working Wood. Thank you for a well thought out presentation. Very inspiring!